It is highly recommended that you thoroughly read / listen to as many of these as possible. On Youtube there is a video of Dr Natasha presenting at the Wise Traditions conference in London in 2010, which is very worthwhile watching. If you search on Youtube, there are a number of other presentations as well. 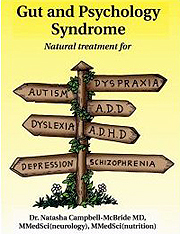 NZ GAPS pages on Facebook –https://www.facebook.com/Gut-Psychology-Syndrome-GAPS-New-Zealand-126887817399605/ set up by Deb Gully, with Catherine Garner as co-Admin.